The Cost: $26.95 per month + $5 U.S. shipping. 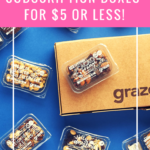 Discounts on longer subscriptions. The product list is on the back of the poster. I love olive green, so I like this cool graphic tee. The fabric is nice and sturdy, and the image of Asta is cool. I kinda wish they didn’t do the “distressing” on the image, but I don’t mind it either. Ugh, I LOVE the Banpresto figurines that come in this box! This Deku statue stands at about 6 inches and has so much awesome detail. Maybe the pose isn’t the most dramatic, but the reality they brought to the folds in the jumpsuit and even the laces on his boots are pretty incredible. This hat is amazing. I love a flat brim, and the gold accents are so cool. I appreciate that the emblem is embroidered on, too—no patches or prints. I can’t wait ’til my hair is long enough that I can pop my ponytail through the back of this snapback hat! I’m a big fan of the DC universe, and this manga version of the Justice League characters is right up my alley. The art is so dynamic and expressive. It’s really neat seeing these familiar characters interpreted in a new way. The Verdict: I liked this month’s Loot Anime. I was so surprised by the hat—it was such a stylish accessory to see in a Loot Anime box! I’m digging the quality of all of the goodies I get via this subscription and the fact that so many of the items are exclusive. Value Breakdown: At $31.95 (shipping + cost of the box), the average cost of each item is $7.99. What do you think of Loot Anime this month? What is the sword girl poster from? Or is it not from anything? they are putting less and less stuff in this box =/, really bummed about it.